Strollers — every parent needs one. Convenience — every parent wants it. 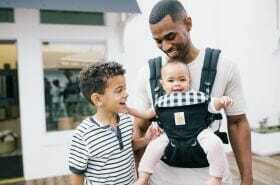 And with these 20 stroller hacks, you can make using your stroller more convenient and functional, as well as provide a safer and more comfortable ride for your little one. Use colored stickers to label the buttons and levers of the stroller with instructions, i.e. 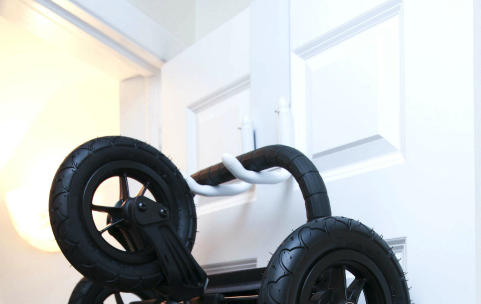 pull and push, so your partner, grandparent or whoever is walking your child can remember how to use your stroller. Use one or two sections of a hanging shoe organizer to keep bottles or sippy cups that won’t fit in cup holders (or if you don’t have them) from spilling. Put adhesive velcro on the back and stick it to the inside part of your undercarriage storage basket on the side closest to you. Use tennis racket grip tape to wrap around your handles when the material starts wearing off. This tape is made for people to have a good, comfortable grip, and it comes in a variety of colors. Use large, heavy duty climbing carabiners on your handlebar so you can shop hands-free, while your stroller acts as your butler or partner, carrying multiple bags for you. You can also clip on a utility tote to hold your bags. For those shopping days, it’s also smart to wrap ankle weights to the front of your stroller around the bottom of its legs. 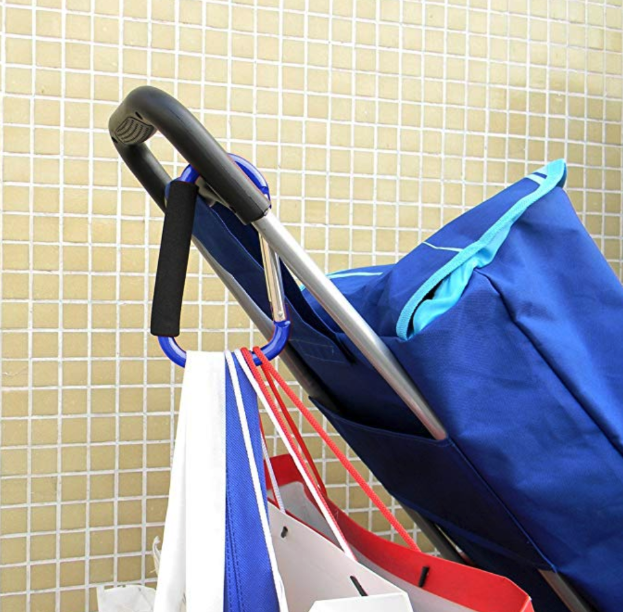 This little hack will keep your stroller from tipping over backward because of too much weight. Along with a stroller comfort cushion, make or buy a cooling pad for your kid to sit or lay against on the seat during the warmer months. Another summer hack — Get and attach a small, battery-operated fan to keep your baby cool on those hot days. 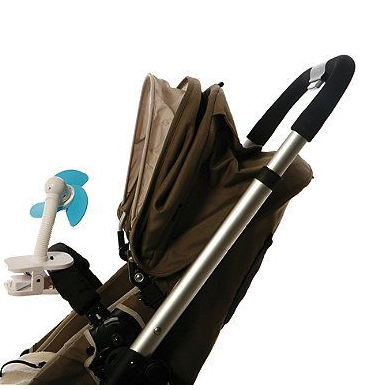 During the icy and snowy winter months, put zip ties around the stroller’s wheels—be sure to cut off any excess. This will help you get better traction on slippery surfaces. It’s a great hack for all you walkers, joggers and runners who brave the cold! Use a baby head support band for when your little one falls asleep, so she doesn’t flop forward. You can buy one or make your own. It also works great in the car with the car seat. Extend your stroller handle if it’s too short. 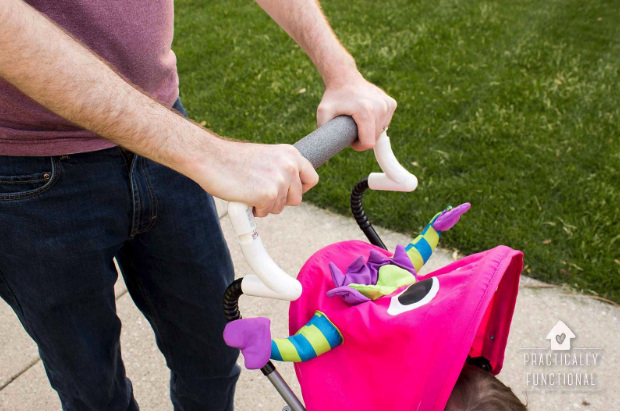 You can either make your own extension using PVC pipe and some other supplies or buy stroller handle extenders if you’re not the crafty, DIY type. If your sun canopy isn’t long enough and the sun is in her eyes, place a thin, breathable blanket, like a light-colored muslin blanket, over the canopy and front of the stroller and use binder clips to keep it in place. Pack your stroller upright in your van or SUV by wrapping a bungee cord around your backseat headrest. This saves space, allowing you to fit more than just your stroller in your trunk. You can also keep shower caps in your trunk or put a cheap plastic bin to put your stroller in, so if the wheels get dirty they won’t get your car dirty. Want to free up space in your garage, too? Put an over the door hook over your garage door (the one leading into your house) and hang your stroller from it when you’re not using it. Your child isn’t the only one who should be protected from the sun. Especially if you’re pastey white like me, then a portable, swiveling umbrella that clamps onto your stroller and keeps you shaded is a must-have item. It can be used in other places as well, like on the top bleachers during football games, so it will pay for itself quickly and save you money in store aloe vera runs during the summer. Use a flexible bike lock to keep your stroller safely locked up, so you can rest easy when you need to leave it unattended in a public place. Put pieces of reflective tape on your stroller so it’s more visible at night. 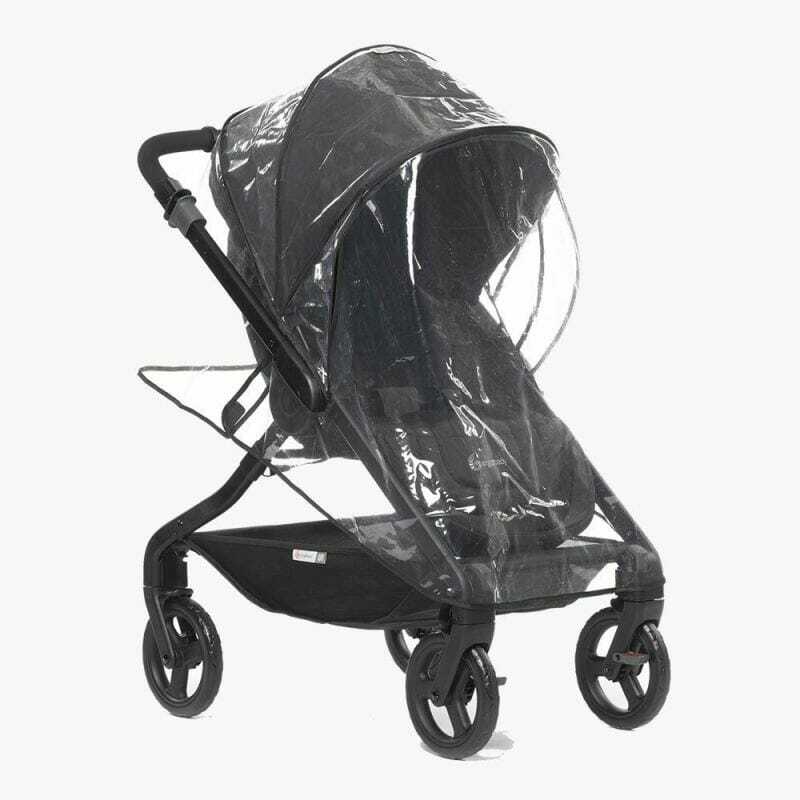 A stroller weather shield makes rainy-day errands and walks possible. Get a cup strap and stroller snack tray. Stopping to bend over and pick up a thrown bottle or sippy cup 10 times during your 15-minute walk will get old fast. A cup strap ensures that even when your toddler sends his cup flying, it won’t roll away or land face down in the dirt. Use part of a pool noodle to make lifting the car seat in and out of the stroller and your car easier. Take the pool noodle, cut the size you need, cut a slit down the middle and then wrap it around the handle of your car seat. It won’t help lessen the weight, but it does help ease the burden of carrying a car seat because a pool noodle is a lot softer than a plastic handle. Easily clean your reversible stroller with dish soap, warm water and a sponge, and then rinse it off with a hose and set it out in the sun to dry. But that’s not the real stroller hack here. When you’ve got a toddler, make her do it. Tell her it’s her very own car wash, give her all the supplies and let her clean away. Use her not knowing this is really a chore to your advantage while you can.